1 Preheat the oven to 200ºC/R6. Put the rhubarb in an ovenproof dish, squeeze over the orange juice and sprinkle on the zest and sugar (if using). Bake for 10-15 minutes until just soft but not mushy. Leave to cool. 2 Turn the oven down to 160ºC/R3 and line a 23x33cm (9x13in) Swiss roll tin with baking parchment. 3 To make the roulade, in a large mixing bowl, whisk the egg whites to stiff peaks. Mix the caster sugar with the icing sugar and add this, a little at a time, whisking continuously until the mixture is thick, glossy and stiff. Add the salt, lime juice and cream of tartar and whisk them in. 4 Spoon the mixture into the lined tin and level it out. Sprinkle the chopped almonds on top. 5 Bake for 20 minutes until risen, the almonds are golden brown and the roulade is lightly coloured. 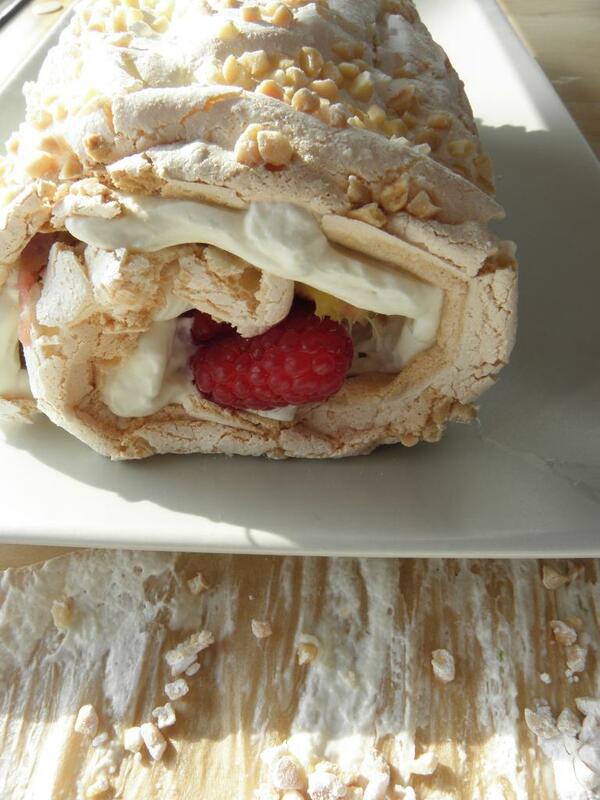 Remove the roulade from the oven and turn it out on to a sheet of baking parchment. Carefully peel off the lining paper and let it cool for a few minutes. 6 To assemble, whip the cream with the vanilla extract until thick, then fold in the fromage frais. Spread this evenly on the back of the roulade then scatter the raspberries and rhubarb on top. 7 Lifting the baking parchment under a short side of the roulade to help you, roll up the roulade, coaxing it over itself at first. 8 Lift it on to a serving plate and chill in the fridge until needed. Dust with a little icing sugar before serving.